Of the 4 professional major sports, hockey players are paid the least in comparison to the athletes of the other sports. 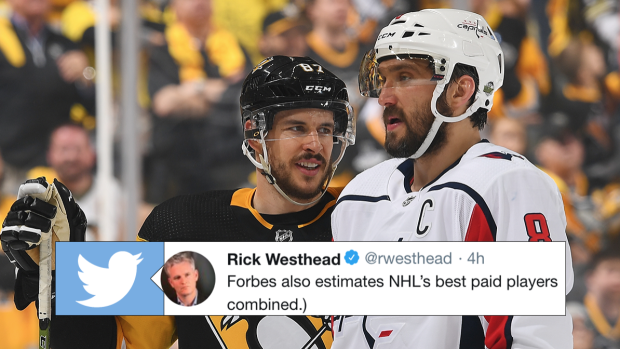 We're not here to get into why that is, but we are here to talk about specifics because on Tuesday, Forbes released their list of the highest paid NHL players and they didn't just take salary into account. As per TSN's Rick Westhead, the number for each player is a combination of on-ice and off-ice endorsements combined. Of the top 5, seeing Sidney Crosby's name in the 5th spot is probably the most surprising number of all them. It makes sense, though, that Connor McDavid is at the top of the list as he's arguably the best player in the world and one that the league wants to market.